Filled with witty punchlines and accounts of the crests and troughs of hood life, the first Y.F.F.R. (Your Favorite Fat Rapper) was received with much acclaim from the internet and underground hip hop communities. Still running off of the steam of this first mixtape, G. Bag$ is now in the studio recording and promoting the second installation, due to be released July 4th of this year. Y.F.F.R. 2 is going to be loosely themed off of the classic movie in the hip hop community, Juice. Here’s a leaked track from off of the upcoming Y.F.F.R. Part 2: Who’s Got The Juice Edition. Get the original Y.F.F.R. here. This entry was posted on May 12, 2011. 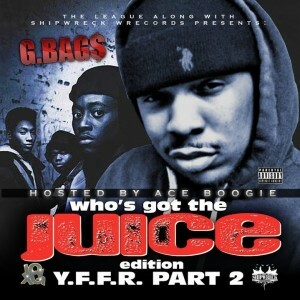 It was filed under Music and was tagged with 2, Albany, Bag$, BMF, G. Bags, hip hop, mixtape, NY, Y.F.F.R..